The Teaching and Teacher Education PhD specialization focuses on research, development, and evaluation of teacher education for both pre-service teachers and the continuing professional development of practicing teachers. The Teaching and Teacher Education specialization has a specific focus that ties the study of teachers, teaching practices, teacher education, education reform, and education policy together into a coherent whole for understanding and generating new knowledge on the educators of educators who will lead the efforts of an equal education for all children. The program focuses on the research on teaching from a generalist perspective as well as providing opportunities to study teaching in a chosen subject matter area, e.g. English, history, special education, etc. In addition, the program focuses on research, development, and evaluation of teacher education for both preservice teachers and the continuing professional development of practicing teachers. The PhD in Education program requires a minimum of 85 credits of study beyond the baccalaureate degree or a minimum of 55 credits beyond the master's degree. Students have five years to complete all course work and the portfolio, and five additional years are allowed to complete the dissertation. The program requires a minimum of 85 credits of study beyond the baccalaureate degree or a minimum of 55 credits beyond the master's degree. However, an individual's program typically requires 10 more credits depending on the person's goals, program requirements, and previous preparation. Students have five years to complete all course work and the portfolio reviews. Five additional years are allowed to complete the dissertation. Most students complete the entire program in five or six years. These courses differ according to a student's major specialization but always include three hours of internship credit. Select 18 credits from courses listed below. Teaching and Teacher Education as a secondary specialization: This program can serve as the secondary specialization for students who choose a specialization in another program area, but who desire to move toward a career educating teachers, either in a university or a school division. In consultation with the student's program committee, twelve credits selected from those above would satisfy the College's secondary specialization. Secondary specialization for students whose Specialization is Teaching and Teacher Education: There is no recommended minor for students in this specialization. The identification of the minor the students will create will be the result of consultation among the student and the members of her/his program committee. 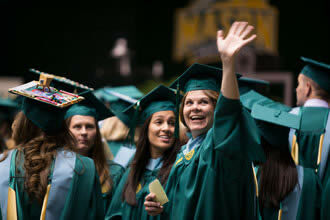 Students have a number of options for secondary concentrations including concentrations within the Graduate School of Education, within other George Mason University departments, interdisciplinary concentrations, or using the master's degree as part of the secondary concentration requirements. Students complete an educational portfolio as part of the requirement of the Ph.D. program. The portfolio is an organized, selective collection of documents designed to facilitate a student's academic and professional development, and to provide a basis for evaluation of degree progress. The portfolio represents the scope and depth of a student's goals, plans, and accomplishments in coursework, independent study, research, internships, and other advanced learning activities. The portfolio thus provides both a vehicle for self-reflection and a comprehensive record of a doctoral student's experiences and ongoing progress toward academic and professional goals. Contact the Ph.D. Program for additional information.